Prosecutors used it to refute a guard's excuse that he wasn't aware of the murders. German police have used VR forensics tech to prosecute a Nazi war criminal who worked at the Auschwitz-Birkenau concentration camp. The team from the Bavarian state crime office (LKA), led by investigator Ralf Breker, created highly detailed digital models of the facility using maps from a Warsaw surveyor's office and over a thousand period photos. Using an HTC Vive headset, they were then able to see exactly what the accused would have seen at the time. "The model can be used in trials to counter the objection of suspects who claim that they did not witness executions or marches to gas chambers from their vantage point," Nazi war crime investigator Jens Rommel told NBC News. The technique was used in the trial of former SS guard Reinhold Hanning, who was sentenced to five years for his role in the murder of 170,000 prisoners at Auschwitz. "The advantage the model offers is that I get a better overview of the camp and can [see] the perspective of a suspect, for example in a watchtower," Breker told the AFP. "To my knowledge, there is no more exact model of Auschwitz." The team even recreated the original trees, allowing prosecutors, judges and others to determine if a plaintiff's view was blocked or not. 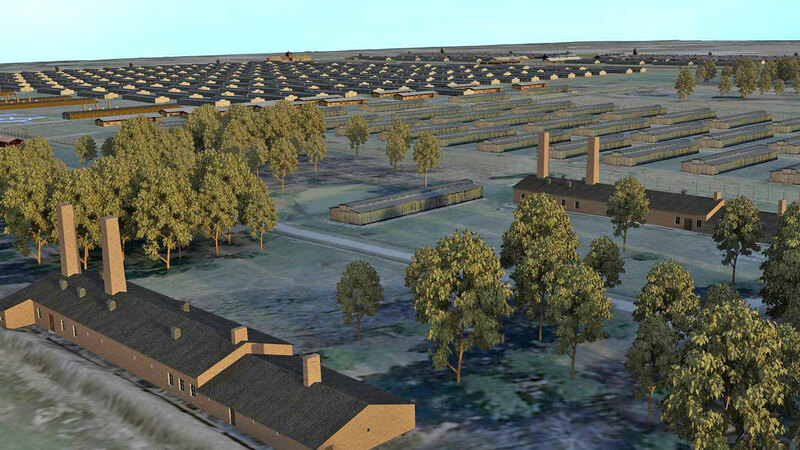 Breker also uses 3D techniques to solve modern murders, but said that the Auschwitz project was particularly difficult. "When I got back to the hotel room each night after being at Auschwitz, I was shattered. We spent each day with the head of the [Warsaw] archive and he provided us with so many shocking details." During one period, for instance, 438,000 Hungarian Jews arrived at the camp, and the volume of people murdered and cremated caused the chimneys to crack. "The SS men then actually built drains for the fat to collect from the bodies, which could be used to fuel the fire for the next round of corpses," Breker said. "There are truly no words for it." The team does get some satisfaction knowing that its technology could help convict the "double-digit" number of Nazi war criminals who are still alive today, though. Breker also feels the technique can be used in modern courts. "In two or three years, you'll be able to enter the scene of every serious crime virtually," he says. The model might also be loaned to Israel's Yad Vashem memorial, so that visitors can see for themselves the massive extent (15 square miles) of humanity at its worst.